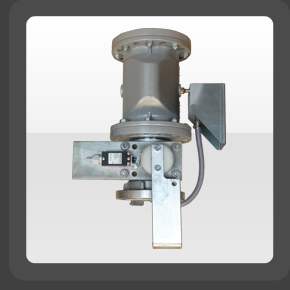 Next to silos the pinch valves SQV are also used in several pneumatic conveying systems of the chemical and pharmaceutical industries, sand, concrete and cement industries, glass, ceramic and plastics industries as well as in dosage and weighing systems. The basic valves are available from DN 40 to DN 200. The exchangeable sleeve is available in different elastomers for most diverse requirements. The housing and cone flanges of the valves are available in aluminium (standard), stainless steel or grey cast iron. As standard the sleeve is made of black natural rubber (NR), on request it is also available in white natural rubber (food-safe) and electrically conductive (ATEX). The pinch valve closes by adding control air to the sleeve. By removing the control pressure the sleeve opens up to its full cross section. The design of the housing ensures proper closing of the sleeve and therefore safeguards the product flow to be shut-off absolutely tight as well as a maximum service life of the sleeve. Even larger solid particles are tightly covered and shut off.